Today we will take a look at how to deal with acute burn injuries. 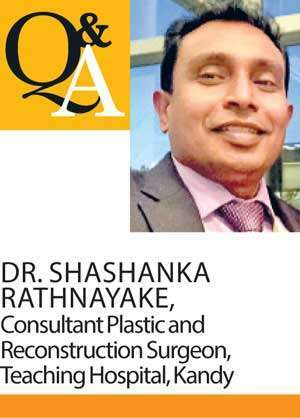 For this purpose we produce excerpts of a discussion on the subject we had with Dr. Shashanka Rathnayake, Consultant Plastic and Reconstruction Surgeon Teaching Hospital, Kandy. QAre burns common in Sri Lanka? Burns could happen due to several reasons. With regard to adults and children accidental burns are common. Burn accidents could happen due to hot water, other hot liquid burns like hot oil, hot curries, gas cooker flame and injuries caused through the kerosene oil lamp. There can be burns due to coming in contact with hot surfaces like the hot cloth iron appliances in the kitchen or at the work place. We also see injuries due to chemical burns and also burns caused by electricity. Due to the developments in the country and the supply of electricity to the rural areas the number of accidental kerosene oil lamp burns is reducing. We do see self inflicted kerosene oil burns unfortunately. Some of these burns are very severe and such patients are beyond being treated using plastic surgery. QWhat is the cause for self inflicted burns? This is exclusively common in the Asian culture. I believe this is a learned behaviour and the movies and tele dramas probably are responsible at least indirectly. Suicidal burns aimed at teaching a lesson to powerful authorities are popular in our culture and such incidents sometimes receive much publicity. In this background, most married women in Sri Lanka are unemployed and have to depend on the husband for everything. In the usual scenario a woman with two children is struggling to live with a man who is deviating from the expected level. The man is very powerful and the woman is helpless due to being unemployed. Then there would be serious unsuccessful attempts to control the husband and ultimately the woman resorts to threaten the husband with an attempt to commit suicide. Most often women pour kerosene oil on their upper bodies and they do not understand the end result. This might settle if the husband is a sensible person. Unfortunately, the husband never believes or cannot understand the real agony the woman faces and tries to win the situation by trying to suppress her. This drama could result in a severe burn incident which is life threatening and challenging to salvage. QWhat are common first aid measures? It is very important to know what should and should not be done. Our advice on the burn injury is to pour water over the affected area for 20 to 30 minutes. The best guide would be to pour water till the pain disappears. When this is done for chemical burns the clothes should be removed before irrigating with water. Whatever said and done in our culture people do various things as first aids and we do not recommend any of them. Nothing can be superior to water. There could be myths which discourage the use of water. Such myths must be dispelled. There could be myths on magic material like Aloe Vera, egg white or yolk, tooth paste, Ayurvedic oils as first aid measures. The use of all this should be discouraged because there is no scientific basis behind these types of treatments. The first aid should be focused on removing the heat and that can be effectively done only with water. Please understand Aloe Vera and Ayuvedic oils may be effective in burn wound healing, but should not be used as a first aid. It is understandable when a electrolocuted person is removed from the place before pouring water because the man who is trying to salvage the patient may get the electric shock otherwise. QWhat must be done after administering first aid? This depends on the extent of the burn and the areas of involvement. Usually the minor burns could be handled by the local doctors or the local hospital. However, if the burn area is exceeding more than 10 to 15% , it should be managed by a plastic surgeon. Then the burns in the face, neck, hands, over the joints, in the genital area, buttocks etc should be seen by a plastic surgeon at least after sometime in the clinic. I think people should be wise to seek appropriate treatment as many things have advanced and burns should not be managed in a traditional way. QDo you practice ideal burn management in Sri Lanka? Obviously not. But we as plastic surgeons manage burns which surprises overseas visitors who have enough resources. We have changed many aspects of burn care. This is experienced by the patients visiting the Teaching Hospital, Kandy. In order to practice ideal burn care the Government will have to spend a lot of money in establishing a burns unit. Unfortunately, our country does not have a fully equipped burns unit and we cannot salvage patients when the burn percentage exceed 50% - 60% which is sad. Many important people have died of salvageable burns due to lack of facilities. I think it is time to think about these things and plan the way forward. QWhat are the changes made in the burns management in Sri Lanka? I used to see open burn wounds when I assumed duty at the Teaching Hospital, Kandy at the beginning of last year. The burnt patient was covered with a mosquito net and it is the most unpleasant sight one would get in a surgical ward. We have changed that practice and the burn wounds get appropriate treatment with proper dressings. We do not usually practice daily dressings which is really painful for the patients. Instead we use special dressings which can be kept for about five days. This gives the burnt patient a big relief from the pain caused by the dressings. Giving the patient daily baths is an outdated practice. This is a good question. I will explain this with a simple example. Let’s assume a child getting a hot water burn and for the special dressing the parents have to spend Rs 5,000. Apparently it is too much and should not be practiced. However, that dressing will be done only once and will peal off when the wound heals. The child does not suffer burn pains and would sport a nice smile. The alternative way of managing such an injury is using daily dressings. With such a method the child will suffer daily torture for about two weeks. There is a high chance that the burn wound will get infected and need further surgery; prolonging the patient’s hospital stay. If the wound is managed in the hospital then loss of parent’s working hours and lack of attention to other kids have to be taken into account. In addition, if the child has to be brought to the out patient department for wound dressings, the time spent and the cost for transport like for the taxi has to be counted. Obviously, it is more profitable to opt for the expensive dressing .Therefore, we need to think differently and talk about cost effectiveness rather than the cost alone and it is time for this attitude change. QWhat are the other strategies you are applying to create a better outcome? We offer various strategies like early skin grafting and scar therapy to achieve a better outcome in terms of acute burn care. The skin grafting techniques are better known to plastic surgeons and usually do not cause problems after surgery. I see complications of skin grafts which were done inappropriately and without proper knowledge about it. It is sometimes disheartening that we cannot offer many things to those patients as the limited resources of the skin have been utilized inappropriately. We cannot discuss all these in a single article . We will discuss the appropriate burn wound care and scar management in subsequent articles.